Ant's, Beetles, Hopper's and Trout! The dog days of summer in the west bring out the ant’s beetles and hopper’s. To some fly casting anglers hopper season is the season they have waited for. Fly fishing on the North Platte river and surrounding waters has been solid as of late. Those trout that snubbed a dry fly the last time you were out might have been waiting for something a little bigger. Terrestrials are active and so are the trout that eat them! Our lakes have also been fishing great with a number of nice damsel eating trout brought to hand this past week. Spur Outfitter’s has open days available for this special time of year. 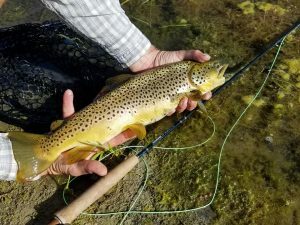 Ask about our combination day that includes a guided morning on one of our lakes for brook, brown, and rainbow trout and then top the afternoon off with some great hopper fly fishing on the river!